Australian turkey breast deboned & stuffed with Maria’s delicious festive ‘secret’ stuffing made with seasonal ingredients such as chestnuts, cranberries, pistachio, parmiggiano, fresh herbs & much more. It’s then rolled and wrapped in our finest pancetta and baked for your convenience. Our turkey can be eaten cold or re-heated on the day. For more info & serving ideas, please feel free to direct your questions to Maria. YOU MAY ALSO BUY IT RAW (ready to cook at home). Nut / Gluten free options available. Australian and of premium quality, our hams are delicious and juicy. De-boned with a small ‘shank’ at the end with a weight range of 7 – 9 kg. Smaller hams come available but you’ll need to get your order in REAL quick! 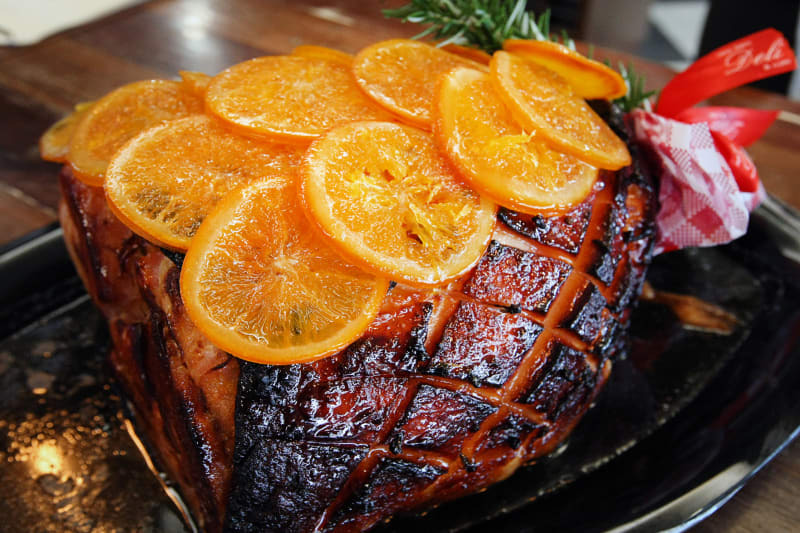 We glaze our hams with orange, quince & maple and brandy. Alternatively, we can supply you with a ham for you to take home and serve ‘as is’ or glaze and bake it yourself ...the choice is entirely yours! GLAZED & BAKED (COLD) OR PLAIN/ UNDRESSED. Australian pork loin seasoned with our own Italian cheese & fresh herbs stuffing mix. Cooked and sold by the piece. Our thick Italian sausages are made to our own recipe using only pure pork without artificial additives. Be sure to buy some to BBQ, fry, add to pasta sauce or perhaps use as a delicious stuffing. Be sure to place your order early and buy extra to freeze for later use. Gluten free. For the perfect break from cooking, be sure to stock up on all your favourite sauces from our freezer. To be super organized and to avoid missing out...if you know what you’ll need, pre-order or stock up early! Raw Atlantic salmon, cured in salt, sugar, vodka and dill. Perfect thinly sliced and served as an appetizer on crusty bread, boiled potatoes or simply, with a crisp salad. Accompanied with a crème fraiche dill, caper and lemon sauce. 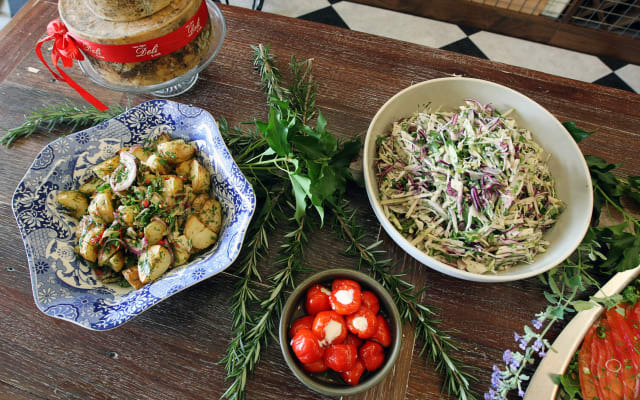 Delicious salads will delight your guests. Roasted Potato Salad pictured left and Apple Slaw on the right. Also available is the Barley, Creamy Pesto and Broccoli Salad. Regular size is $45 and Large is $55. The Pepper Dews add that splash of red to the table! Complete your Festive spread with Quicke's Mature Cheddar Truckle. We make our lasagne with simple, natural Italian ingredients, without preservatives or artificial additives - just like our other meals. Our lasagnes can be provided to you cooked or uncooked, ready for you to cook at home. Alternatively, we can supply to you frozen for later use ...your choice! For that very special gift, why not choose one of our Deli Gift Hampers? A superb selection of premium, quality gourmet items beautifully presented. Ideal for personal and corporate gift giving. The hampers can be delivered locally and interstate. Maria’s bestselling New Farm Deli Cookbook is a classic of Italian country cooking. Filled with recipes for every occasion the books explains Italian cuisine from the basics to the more adventurous. Maria shares the story of New Farm Deli, her own family traditions, a day in the life of the deli and much more. 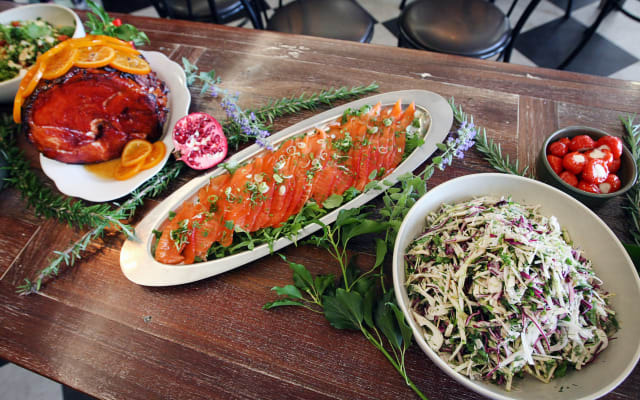 For the person who has everything, we offer New farm Deli Gift Certificates . The In-Store Gift Certificate is redeemable in the Cafe or Deli. They can enjoy a delicious meal or stock the larder from the vast array of delicacies. The recipient simply presents the certificate for a deduction off the total bill. To secure that special cheese or cured meat you’d like to serve at Christmas lunch, we recommend you place your order for all deli items early. Nominate a day and collection time and your order will be prepared accordingly. Our friendly deli team is ready to take your order. 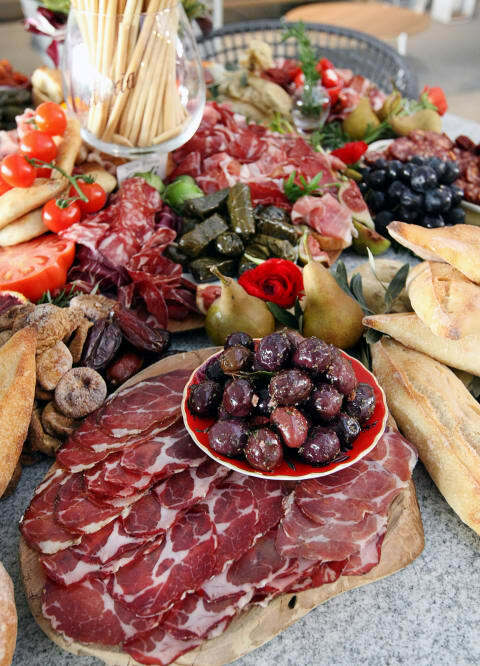 To keep your goods fresher and longer over the extended holidays, we can cryovac your meats, cheese, olives, ham, etc. Ask us for more info. to discuss your choices and place your order. – but do it before 21st December.